How do you know when a car is a real Shelby? It is a question many people have struggled with. I first met Mike on the Shelby American Automobile Club’s forum (www.saacforum.com) . Mike had found a red, convertible. He thought the car might be a Shelby. However, the car was missing some very important parts. Mike was new to Shelbys, but recognized some red flags right away. 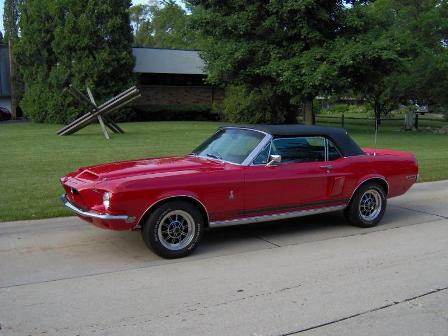 After having a friend check the Shelby American World Registry he realized there was some information about the car. The registry is a collection of information on all the Shelbys built. Information reported to the club and from factory records is carefully recorded. The Registry indicated the car was originally shipped to California and the original color was Sunlit Gold. Normally, when a prospective owner looks at a car and it does match the Registry, my advice would be quite simple. “Run away, run away fast”. But, as Mike relayed more information, I became more interested. The warranty tag, normally found on the door, was missing. The Shelby vehicle identification tag was missing. The roll bar was also missing. I told Mike, if this was a real Shelby all of these items had to be accounted for in some way. Mike spoke to the seller at length. The lady had inherited the car from her brother in 1989. Sadly, he had passed away. She did not know a lot about the car, but felt strongly it was a Shelby convertible. She told Mike, the roll bar and tags had been stolen years earlier when the car was getting worked on. Then, the picture came into focus. Her brother was from California and had owned the car since the late 1970s. He had actually leased the car for several years before taking ownership. She had all the paperwork to support her claims. She also found an old photograph. 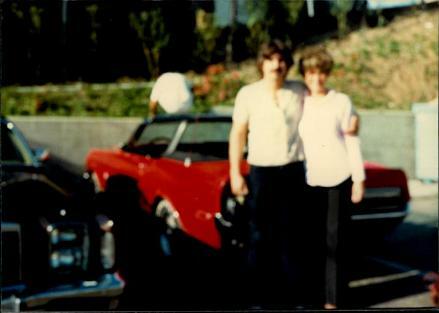 The picture shows her and her brother with the car in the background. Mike was convinced it was genuine and he made a deal to purchase the car. Mike invited me to inspect the car. I gave the car a good look and at first glance the car looked very nice. I made some very interesting discoveries. After removing the rear, interior quarter panels on the car, I noted Sunlit Gold paint. As I carefully scrapped away old sealer, it became evident the gold paint was underneath the sealer. There were a few other small areas of gold paint showing through the bright red paint job. These were by far, the most convincing. I could also see the unmistakable evidence the car once had a roll bar. Original Shelby anchors for the inertia seat belts were still mounted in the car. Every hole and production nuance matched. I carefully removed the original dash assembly. As I did, I noticed the prize that had waited for over forty years. 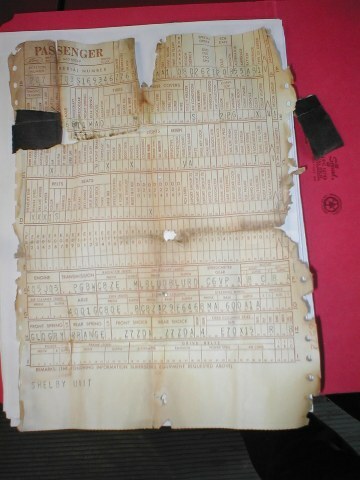 The original build sheet was taped to the main wiring harness. I removed the sheet and carefully unfolded it. A quick looked revealed the sheet did matched the Ford VIN still present on the windshield tag and inner fender apron. It did belong to a 1968 Shelby convertible. The car was serial number 1493. Originally built as a Sunlit Gold, GT500 with air conditioning, there was little doubt, this was the same car. Every coin has two sides. Mike feels confident his flip of the coin was a winner. I would have to agree. The evidence is very strong. The documentation shows an almost unbroken chain to the original dealership. Mike’s diligence helped him find # 1493. 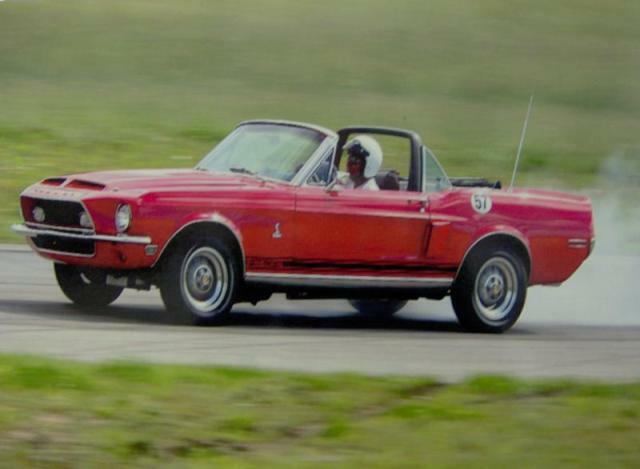 Mike puts his GT500 to good use, a quick lap around the track!